Street after street of hollowed-out homes. Sidewalks piled high with debris. Ovens and shoes and electronics and books—all the private pieces of a life—were gathered on lawns waiting to be hauled to the dump. Keller Williams has a longstanding tradition of philanthropy through its nonprofit arms, KW Cares, an emergency financial relief charity, and KW Kids Can, an organization focused on youth education. The company’s efforts in Texas, however, topped it all. Over 4,000 Keller Williams associates and family members traveled to Texas to volunteer after Hurricane Harvey struck. In late August, organizers were setting the stage for Mega Camp, Keller Williams’ annual conference in Austin, which has grown into one of the country’s largest real estate education events. Unfortunately, Harvey tore through Southeast Texas on August 25, leaving unprecedented damage in its wake. While Austin was left unharmed, Keller Williams Realty International CEO John Davis and his team knew that Mega Camp could not go on as planned when there was so much damage and so many lives thrown into chaos less than 200 miles away. KW officials quickly sprang into action, working tirelessly to reorganize, rebrand, and entirely transform the conference into a grand volunteer effort called Mega Relief. When the army of compassionate KW associates arrived in Austin two and a half weeks after Harvey made landfall, they found a well-organized, large-scale, week-long relief operation. Another company might have canceled the event or carried on as usual, but this kind of action is part of the DNA of Keller Williams: it is a company that sees a need as an opportunity to help. Tim McCall, Team Leader at KW Napa Valley, also traveled to Texas to get his hands dirty. “It was the perfect opportunity to go serve together with people I know who are powerful leaders in the world of real estate.” Agents and associates from all over the globe, including international offices, had planned to go for the conference and were now jumping on the chance to help. Mega Relief was quickly and well organized, but even just the presence of this many helping hands lifted morale. “A lot of support and love flowing from outside boosted the residents and homeowners, knowing that they weren’t alone,” Michael Minson said. The Austin Convention Center was utilized as a base for local nonprofits and a staging area where KW volunteers boarded busses to Houston and other parts of Southeast Texas to offer support at shelters, sort through donations, distribute food, and clean up homes and streets. Anne Kennedy, Partner and Broker of Record at KW San Francisco, helped sort through donations with Second Baptist in Houston. “There was a willingness to do whatever was needed. People signed up for any task that was open.” The massive church parking lot was filled with tents to organize, box, and load supplies to be distributed to victims of the storm. Wendy Davis, Team Leader at KW San Francisco, also helped with donations. “There was a lot of laughter and everyone gelled and worked together, putting together boxes in an assembly line,” she said. The team atmosphere couldn’t go unnoticed. The wildfires that ripped through Northern California in October destroyed at least 8,400 homes and buildings throughout the region—5% of all the homes in Santa Rosa—according to the LA Times. They’re calling it a housing crisis, and Keller Williams agents are on the front lines. While it certainly wasn’t a part of official KW relief efforts, Tim and his friends took it upon themselves to save their childhood neighborhood with garden hoses. The morning of the fires, Tim drove with his parents to their family home and immediately got to work. “As soon as I got our fire down, I saw our neighbor’s on fire and grabbed their hose and doused it… I was us just jumping from fire to fire.” The fire department came but they were focused on getting people to safety rather than saving properties. They asked Tim to leave but he refused until he had done everything he could. He estimated, in the end, that he and his friends saved around fifty homes. And the effort didn’t stop when the disasters calmed. Wendy took note of what she saw in Houston and recognized this as a chance to create a disaster relief program in her office. “It’s an opportunity for me as a leader to make sure my agents have a plan.” Now she and her team are working on a program, which includes organizing committees to think about resources like food and water, creating maps with destinations to meet up in case of disaster, raising money, and organizing with allies. 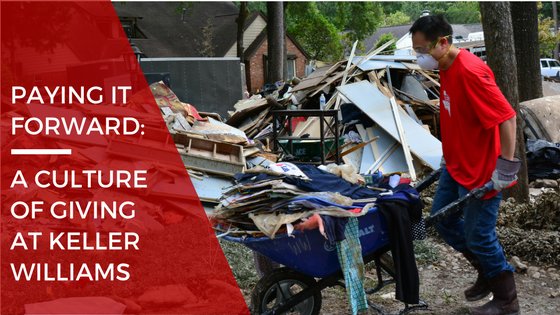 And this is exactly what Keller Williams and KW Cares is ready for—to respond quickly in disasters, determining and meeting the needs of those affected. “KW Cares was built for agents to help and provide in a tragedy like this,” Wendy said. Tim was amazed to see how local KW agents and KW Cares “came alongside every associate and member of our community affected by the fires to see what they could do, offering gift cards, blankets, food, a place to stay, asking what can we do to make this a better situation?” KW Cares has sent supplies and resources to disasters in Florida and Puerto Rico, as well as Northern and Southern California. In the midst of this season, with the hearth and family as symbols of the holidays, it is difficult to comprehend all the people who are still recovering from the loss of loved ones, having their homes destroyed, and their lives uprooted in these last months. But in this season of giving, it is a comfort to know that there are companies that recognize the work is never over. Keller Williams is built on compassion—a “pay-it-forward-based culture” as Michael Minson says—and so it is made of up individuals who care deeply. Michael, Tim, Anne, and Wendy, and the wider Keller Williams family, will not soon forget the people of Texas, California, Florida, Puerto Rico, and beyond. This deep sense of giving is the foundation of KW, and will sustain through whatever disasters may come. As Tim tells it, Keller Williams changed his life, and it will to continue to change others’. As these recent tragedies have taught us, lives can change in the blink of an eye, so this holiday season and into the new year, we encourage you to adopt that deep sense of giving–donate, volunteer, share, give, and be grateful for what you have. From the Keller Williams San Francisco family, we wish all of you a safe, happy, and peaceful holiday season! Click here or more info on how you can contribute to KW Cares’ relief efforts.